Morning sightseeing tour of Old Delhi. Afternoon sightseeing tour of New Delhi. New Delhi - drive past the stately government buildings of the British Era designed by Lutyens, including the India Gate & the Presidential Palace. Continue onto the beautiful Humayuns tomb of the Mughal era & predecessor of the world famous Taj Mahal. End the tour at the towering minaret of Qutab Minar. Exclusive dinner at 'Chor Bizarre' - a "one of its kind" restaurant where each corner beckons you with old memorabilia and bric-a-brac handpicked from various Chor Bazaars (Thieves' Market) all over India. Apart from the Old World ambience and unique setting, it is the only restaurant that serves the most authentic Kashmiri food from the south of the valley. Late Afternoon you will be board on a decorated tongas (horse carriage) for a journey from your hotel to the Taj Mahal this white marble memorial built by Shah Jahan for his beautiful wife.…… Little needs to be said about this architectural wonder which is always the soul raison-de-etre for every tourist's visit to Agra. This monument took 22 years to be completed and was designed and planned by Persian architect Ustad Isa. Apart from it's stunning design balance and perfect symmetry, the Taj is also noted particularly for its elegant domes, intricately carved screens and some of the best inlay work ever seen. The guest will stay at the Taj Mahal till sunset to see this true wonder of the world in gentle late afternoon light. In the evening witness magic show. Magic show - There is nothing that captures the magical spirit of the lad as much as the conjuror who enthralls his audience with sleights of had and a range of tricks. Only the adventurous can volunteer to be sawed in half. After breakfast visit the Red Fort. Drive to Samode enroute visit Fatehpur Sikri. Continue drive to Samode. Upon arrival - check-in at the hotel. Samode - the small principality of Samode lies 50 kms northwest of the city of Jaipur and dates back to the 16th Century. The 7th ruler of Amber, the ancient capital of the Rajput Empire, had twelve sons, one of whom was awarded the feudatory seat of Samode for his gallantry and outstanding service. The construction of the fort began 400 years ago and each successive ruler added to the fort and the palace. Samode Palace - The comfortable palace is today full of architectural delights with stately corridors, frescoed walls ethereal audience halls, harmoniously reflecting the skill of master craftsmen. An evening at Samode is a magical experience of former princely India and part of an ongoing tradition. Morning explore the surroundings of Samode villages. Later drive to Jaipur. Afternoon city tour of Jaipur. Tour of the Pink City - Surrounded on three sides by the rugged Aravali hills, Jaipur is the picturesque capital of Rajasthan. It takes its name from the prince, soldier and astronomer Jai Singh II who moved his capital here in 1727. Jaipur is notable for its distinctive pink-orange coloring. The whole of the old city, including many fine palaces and buildings, was constructed from solid blocks of Sandstone or faced with the same stone. But it was only in 1853 that it gained its famous title, the "Pink City"- it was painted pink for the first time in honour of a visit from Prince Albert. You will also visit the 'Hawa Mahal' , the open air Jantar Mantar Observatory to see the vast astronomical instruments. Enjoy a stroll through the colorful bazaar before returning to your hotel. Overnight at hotel. Enjoy a cycle rickshaw ride through the bustling bazaars. Jaipur is renowned for textile block printing, blue pottery, carpet weaving, semi-precious stones and local crafts which still thrive from the day of Maharaja Jai Singh's patronage when he designed special areas in the city for the 'bandhanas', the 'cheepas' and the 'meenakari' workers. Dinner and an overnight at hotel. Transfer to the Airport or flight Jaipur/Udaipur (0720/0910 hrs). Visit the magnificent City Palace, which is simply enormous - an assemblance of not one but four separate palaces covering some four acres of area and exceeding all other palaces for colossal grandeur. Here you will marvel at rooms with mirrored walls and ivory doors, colored glass windows and inlaid marble balconies; and the Peacock Courtyard. Late afternoon boat cruise on Lake Pichola. Dinner at the Crystal Gallery at Fateh Prakash Palace hotel is a part of the City Palace Complex which was built in early 20th century during the reign of Maharana Fateh Singhji. It is situated on the shore of Lake Pichola and while eating at the Crystal Gallery you will witness the lit up Lake Palace in the middle of the lake which is such a romantic site. Morning city tour of Udaipur. 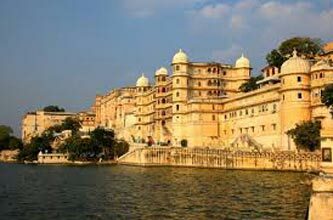 City tour of Udaipur - the romantic Lake City in Southern Rajasthan, famous for the stunning white marble Palace built on an island in the Lake Pichola. It was the former Palace of the Maharana and now converted to one of the most glamorous hotels in India. 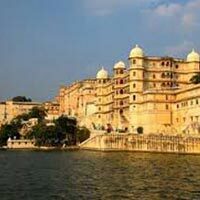 The tour will cover the magnificent City Palace, the Jagdish temple, and a drive around the other nearby lakes. then continue on to the Garden of Maidens "Sahelion-ki-bari' and the Folk Art Museum, to view the interesting collection of puppets & paintings. Afternoon free for own activities and to enjoy the facilities at the hotel. This evening an exclusive dinner will be arranged on floating platoon on the Lake Pichola.Most romantic dinner on the Lake Pichola with Lake Palace lit up at the backdrop. Overnight at hotel. Morning transfer from hotel to the airport for fight Udaipur/Delhi (0810/1045 hrs). Upon arrival the guest will be met and transferred to hotel. Overnight at hotel. Transfer from hotel to the airport for flight back home.